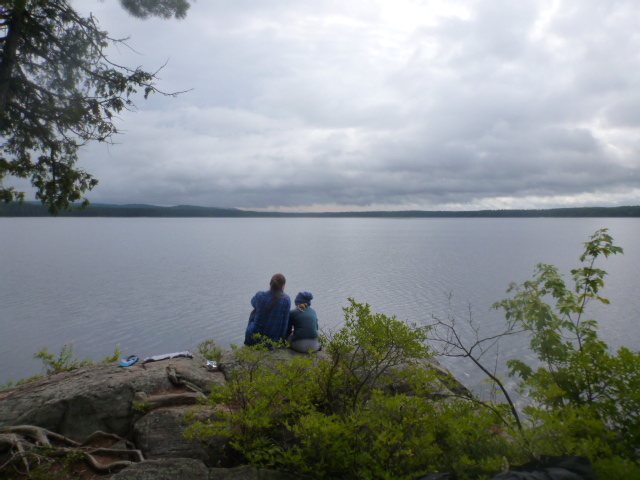 Algonquin is the third largest provincial park in Ontario and a mecca for paddlers from southern Ontario and many others. Our own journey was intended as a half-way meeting place for our my brother- and sister-in-law and their two teenage kids from Connecticut. It was secretly my excuse to explore this beautiful park of forested lakes, pool-and-drop rivers and rugged portages. My wife Thea and I along with our two kids, Ethan and Leah aged 12 and 10 eagerly anticipated our rendezvous. The first day of any trip combines several months of planning and a few frantic days of packing back in Minneapolis before heading east. My son Ethan and daughter Leah were buried in the backseat of my wife’s Prius as we set out on a sunny day from our home. The Wenonah Champlain was precariously balanced on the roof rack and we had crammed the back compartments with portage packs and camping gear. A long hot drive ended for us in Sault-Sainte Marie on the US side to break the journey. The next morning we carried on with our final stopover in Mattawa. This is a lovely, historic little mountain town in mountainous northeastern Ontario. Situated at the confluence of the Ottawa and Mattawa rivers, town is part of the old voyageur history on the doorstep of the Algonquin Park. I doubt this area has changed much since Etienne Brulé and Samuel de Champlain visited as the first Europeans to pass through. We stayed at Le Voyageur Inn, a two-story structure with an interesting bit of character and great food. The town had just survived its annual Voyageur Days when we arrived. The dented-in plaster drywall in the breakfast nook area retained some hints of the level of revelry the night before. 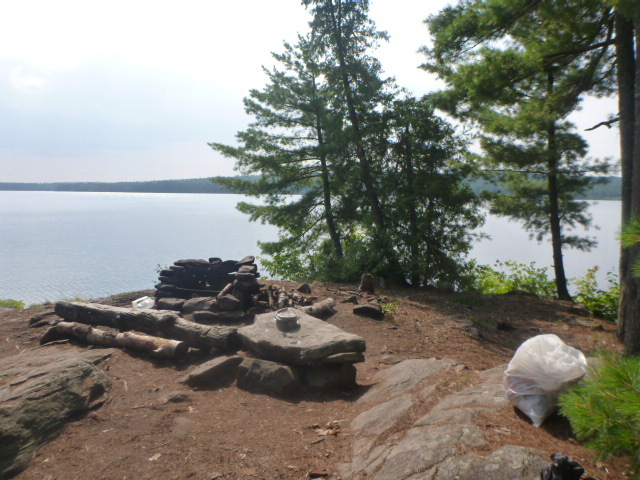 All trips at this northern entrance to the park begin at Cedar Lake, access point 27. We stopped to pick up our backcountry camping permits and reservations for the Brent Campground—where we would stay tonight – from two very pleasant rangers at the ranger station. The drive down to the lake is on a well-graded scenic gravel road with evidence of ongoing logging operations on lands outside of Algonquin. In a hurry to find and set up our camp, we didn’t stop to view the meteor crater but it is well worth the visit if you have time. If you are not getting on the water the first day of your trip out onto Cedar Lake, then Brent Campground is a comfortable place to spend the night. 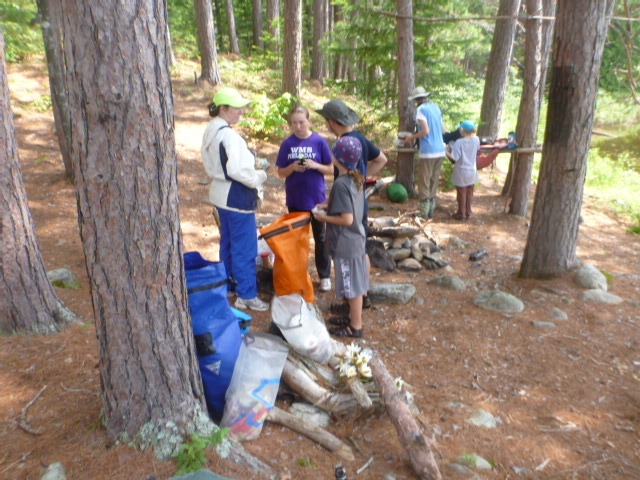 Upon arrival, we set up tents, exploded our gear onto our site and began organizing everything. My in-laws arrived a few hours after us to great cheers. Later we all strolled down the Algonquin Outfitters Brent Store in the hamlet of Brent to discuss our route, canoe and gear arrangements with the knowledgeable and friendly staff in the store. We were in trouble and we knew it. Or at least I knew it. Overcast skies in the morning with predicted rain for later that day. With gear still spread over the grass in our group site, it took us most of the morning to get organized and head down to the outfitters to pick up our boats. Traveling with kids means buying souvenirs pre-trip and keeping lunches and snacks handy. Your motto should always be “you never know”. Finally trucking our gear down to the dock where we would stage our loading operations, the sky let loose and a steady downpour ensued. A true midsummer soaker was upon us. I staggered back into the outfitters to return one last bit of miscellaneous unneeded gear before departing. Water was dripping in rivulets off of my hat and down the back of my neck. My rain gear was soggy. One of the gentleman behind the counter glanced up, without missing a beat remarked “how was your trip?” We were off to memorable start. This was going to be an epic day. Landing at the sandy portage to the Petawawa River, our party slowly organized itself as loads were carried across while bypassing the rapids that roared to our right. It’s not a bad carry though. 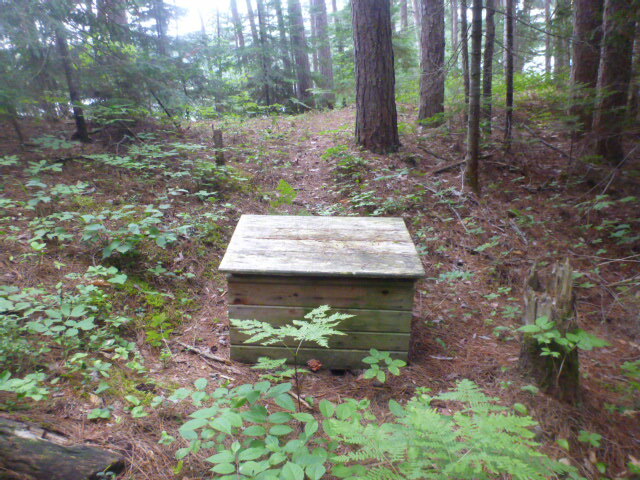 At 985 meters (199 rods), the path begins in a wide open grove of towering pines and is flat for about the first third. 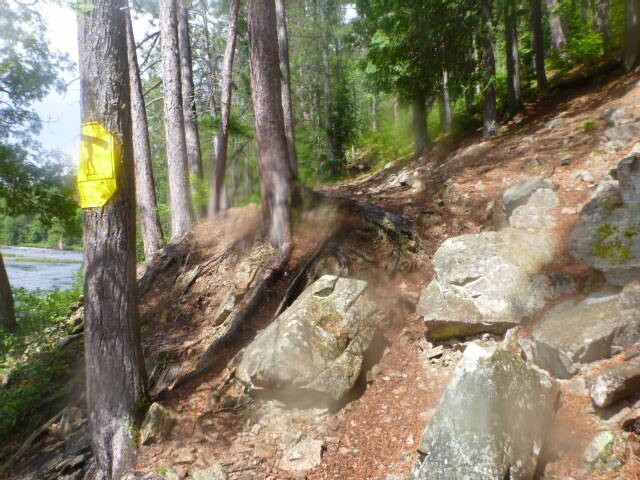 Gradually ascending a ridge the trail crests and then gently descends to a rocky put-in on the Petawawa. 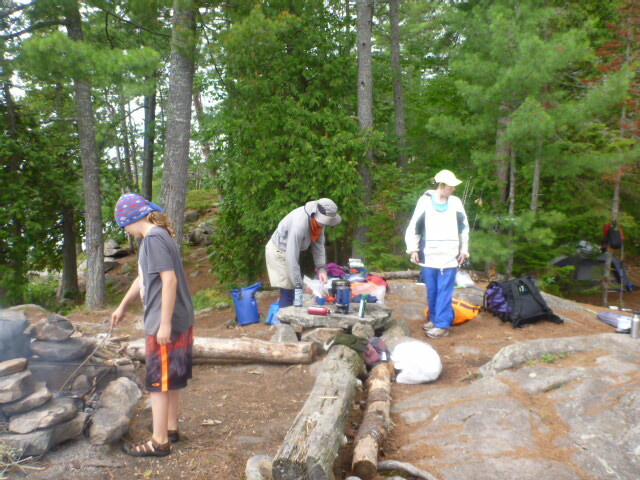 With the horror of the first portage written across everyone’s face, we took an impromptu lunch break before moving on. I noted the fatigue on everyone’s face noting their dawning recognition of what I had gotten all of them into. Rain was now coming intermittently in sheets, drizzle or downpours as we moved out onto the river. Letting up a bit, we reached the second 685 meter-portage (147 rods). This mostly flat trail bypasses a set of rapids and winds through picturesque forest with stands of maples, beech and conifers before passing a campsite and dropping down to the water below a cascade. 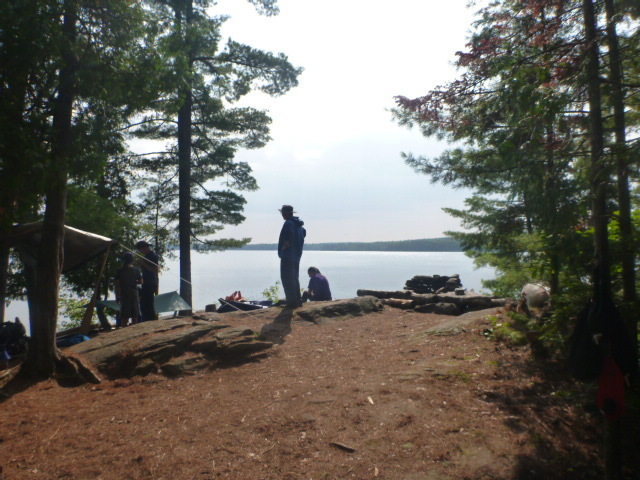 We were picking up speed now and launched towards our next and last portage, a 160-rod railroad bed that would take us onto the final stretch of the Petawawa and finally to Radiant Lake, our destination. You need to know one thing coming in this direction, the takeout on the final portage is a steep, nearly impossible goat-scramble up a craggy, crumbling chasm of rock about 15 meters or 45 to 50 feet up. Vertical might be a more apt description. Once up on the railroad bed it’s a straight walk down the gravel railroad bed the stick-and-rock marker that signals that the trail turns off the left the gravel road. The path at this point dives back downhill into the forest before descending to the sandy put-in. You’re bypassing the Devil’s Chute Rapids, a long series of cascades formed as the river descends on its way to Radiant Lake. We were now on the final stretch of our exhausting day. We completed the short easy paddle down the river in about a half hour turning south as we exited onto the lake. Turning right (south) we easily located a well-used but spacious campsite on a knobby outcropping with a good clearing, established fire ring and plenty of room for our 3 tents. Morning brought fog and mists over the lake. Breakfast was hardy eggs, bacon, oatmeal washed down with juice or strong coffee. Despite motor traffic on this lake, I like Radiant for its calm demeanor. 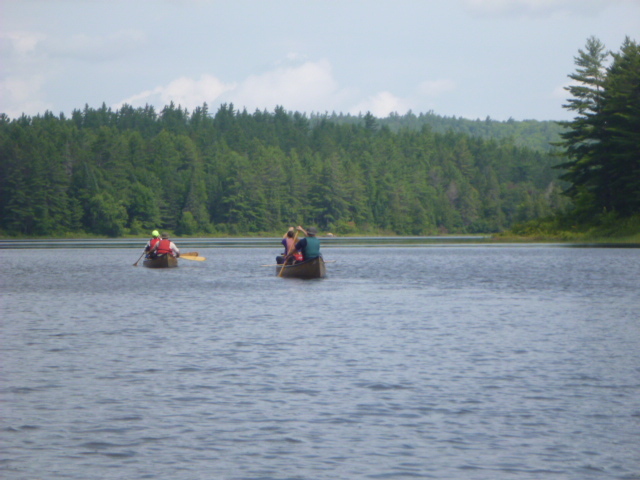 Friendly lake-dwellers motored past us occasionally as they headed to one of the few permanent cabins on this lake. 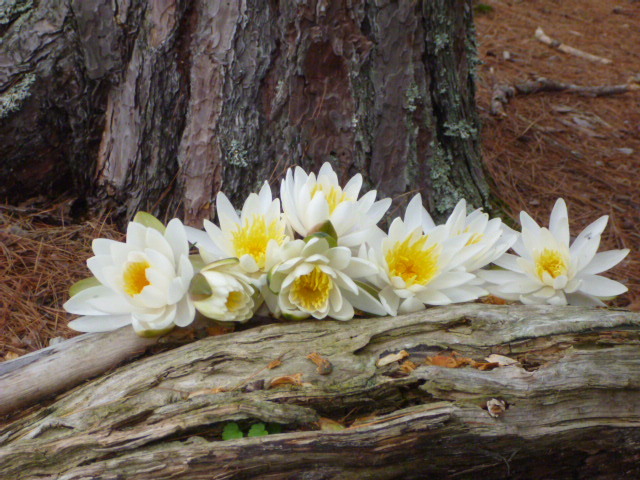 This seemed to comfort everyone and ease that initial sense of wilderness that can be overwhelming to some, particularly those who are newer to this experience. This day was dedicated to sorting out and drying everything that had received a good soaking the day before. At the end of the day, my wife Thea and I headed up the Petawawa to see if I could land fish for the evening meal. A bit of trolling with a rap husky jerk landed a couple smallmouth (several shook off my line as they rose to the surface) and one eater-sized walleye. The day was a success! It was time to venture further out of camp and explore. Shoal Lake was the destination. We were all feeling a bit more adventurous and decided to use our last day to get out and stretch those paddling muscles. I tied on a search lure and we set out from our site heading north/northwest up the inlet to Shoal. Rounding a point in overcast skies threatening rain my line gave a tug and the reel whined as the drag kicked in. Strike! Several minutes later the line slackened and the lure returned to the surface leaving no truce or clue what I had nearly set into. It was a portent of things to come. 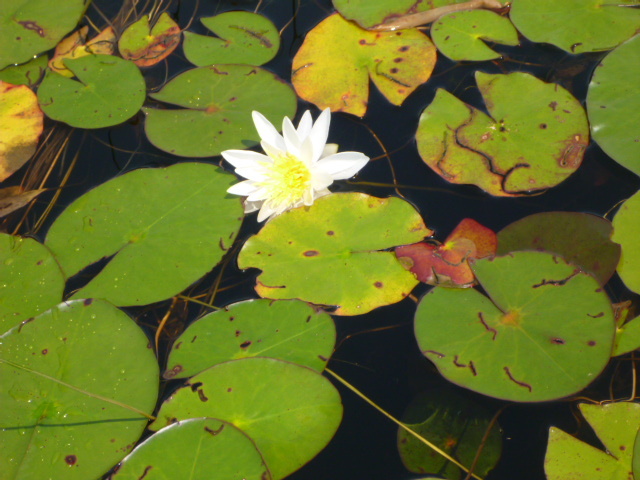 The bay that leads to Shoal is a weedy shallow inlet covered in a carpet of reed grass and lily pads. The portage around a shallow, short stretch of rock strewn rapids is perhaps 15 meters (5 rods) and we simply lifted our canoes over it. The first half of Shoal is more of the same carpeted shallow waters however closer the cascades that tumble in from X lake on the northern side, the lake deepens to perhaps 10 to 20 feet home to a healthy, aggressive and wily bass. There is a fairly decent campsite near the cascades, a bit sloping for more than 2 tents to accommodate but nestled under tall pine and a perfect setting, with the tranquility of the rushing water to contemplate the world – or eat lunch! Which was what we did. I tried my hand at fishing around the cascades as others took a hike over the short 25 or so rod portage to view bucolic Clamshell Lake. My own battles below with the bass resulted in an 0-6 record. Many were hooked, several were set, but shook my barbless hook each and ever time with a well-timed leap. Even one nice dark brownback brought to canoe-side managed to escampe. Oh well, next time. You never forget your first privy. Paddling-out proved far less of an adventure given everyone’s motivation to go. Everyone awoke early around 7AM. Breakfast was everything still left over save few snacks: oatmeal, pancakes, eggs, cheese, crackers, Nutella and bread, yoghurts and coffee or juice. Packing was accomplished in record time for our little party and we were on the water by 9AM. Well-organized and energetic, we attacked the 160 rod railroad portage, loaded again, pushed off and made for the 141 rod portage. Finding refuse at the put-in campsite we packed up fire proof gloves, paper plates, clothesline and miscellaneous bits of papers and wrappers as we trudged down the trail. Here I thought of brilliant idea to shorten everyone’s portage and perhaps regain some of my backwoodsman aura that had been tarnished on the trip in: the short-cut. About 20 rods or so before you reach the put-in on the river, their is a high water put-in next to a small feeder stream that rejoins the rapids further down river. Putting in here saves that last bit of carry and gets you on the river quicker but a large tree is downed a maneuvering around it can be tricky – as we learned! 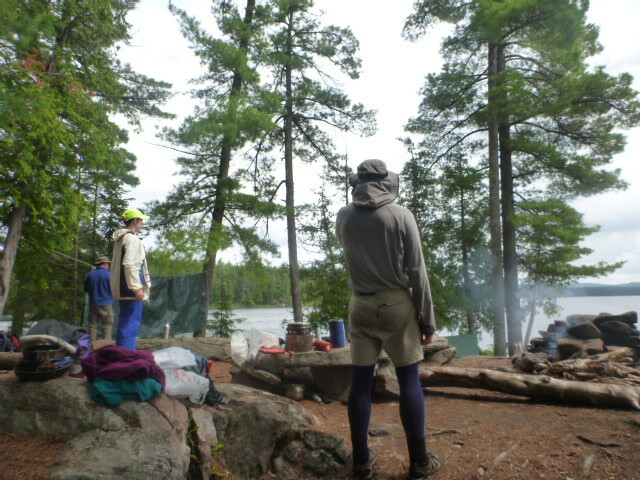 Back on the last stretch of the Petawawa, we paddled to our last, long rocky portage and straggled over it. After a well-deserved break and last lunch at the pine grove next to the put-in, we were off and making the long paddle across Cedar back to the town of Brent. As a result of my own navigational blunder I had our canoes heading into the southwest bay off of the portage. The lead canoe realized my mistake and turned north just in time. Now we were spread across the lake separated by 10 to 20 minutes of paddling. I never realized how long this lake was coming in but going out it seemed to stretch on forever. At one point we picked up our daughter in mid-lake from my brother-in-law Mike’s canoe and she happily clambered onto a portage pack and promptly fell asleep for the rest of our long pull homewards. Dry land never felt so good after we arrived and we did our best to indulge in all the goodies that the Brent Store had to offer! Next day was tearful goodbyes and rolling out on the road. Tim Horton’s was our treat to salve the pain of parting from good friends and family. Hmm…more cheese?…nutella?..or just go fishing?